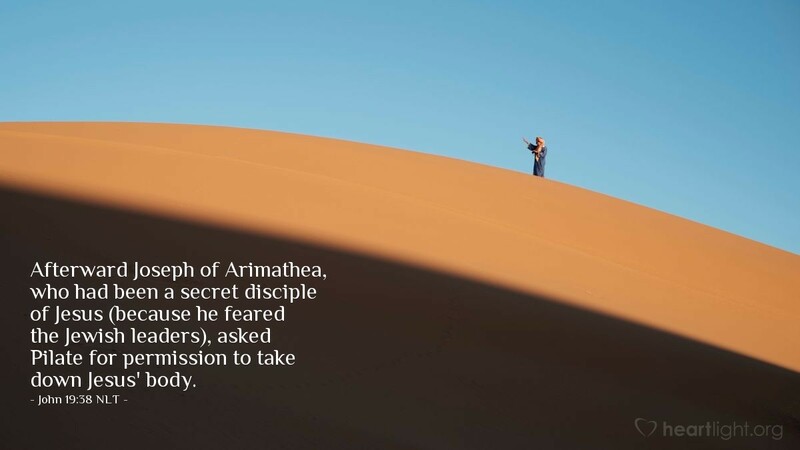 Afterward Joseph of Arimathea, who had been a secret disciple of Jesus (because he feared the Jewish leaders), asked Pilate for permission to take down Jesus' body. When Pilate gave permission, Joseph came and took the body away. Fear has incredible power over us. Fear can paralyze us into inaction. Fear can make us uncertain about what steps to take. Fear can make us pull away from a friendship. Fear has incredible power to destroy our integrity and our fortitude. However, love can overcome fear. Love has the power to move us and motivate us in ways that fear cannot. Joseph had a definite reason to fear, but love won out over his fear. Do you wonder what your fear of rejection might cause you to do or think? Are you not certain you can stand up to ridicule or ostracism? Working on your courage is not sufficient in itself; it is even more important that you seek to know Jesus in your life. After all, that's why John wrote this gospel — so all of us "Josephs" would come to love Jesus for what he did for us and be emboldened by love to do what courage alone cannot do but fear cannot stop. Learn to love Jesus for what he did for you ... for what he is doing in you ... and what he will do! O Father, God of the heavens and King over all, please help me know Jesus more passionately through your word which reveals him in the Gospels, through your Spirit who is working to conform me to his character, and through my experience of Jesus in my daily walk with him. I pray in the name and the power of Jesus and because of my love for him. Amen.